First we had the scandal of Bradford Respect candidate Asif Khan pictured on Facebook holding a machine gun, and now we have another involving sitting Labour Muslim councillor for the city's Toller ward, Amir Hussain. 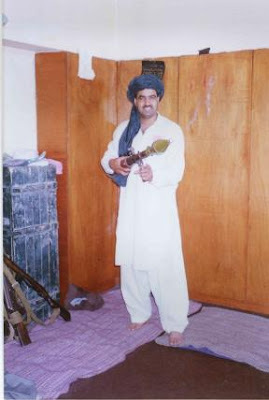 On this occasion however, Mr Hussain is not brandishing a machine gun, but holding a rocket propelled grenade with two guns in the background! Where was this delightful picture (see below) taken? Well, apparently it was taken in Afghanistan as was Mr Khan's, this time 20 rather than 10 years ago. What was Mr Hussain doing there? The Telegraph and Argus reports him as saying that he made the trip "as a local businessman, to distribute funds raised as part of a Bradford radio appeal." If you gave money to that appeal, how do you feel now? Duped? How very strange that Amir Hussain's and Asif Khan's 'charitable' missions to Afghanistan both involved heavy-duty firearms. These followers of the "religion of peace" certainly have an odd perception of 'charity', do they not? Politics in Bradford is a rum old business. Thanks for this one, Durotrigan, it obviously won't be appearing in the Daily Mirror! Ooh, I don't know - he could appear as their Labour pinup Councillor of the month! Mr Hussain, the charity "freedom fighter". Labour are really looking stupid over starting this issue. Their attack on the Respect candidate posting a Facebook picture of himself complete with an AK47 was idiotic. All it did was tell young Muslims that one of the Respect candidates had collected 'charitable' funds in the UK, gone to the Pakistani Tribal zones where he needed armed guards to protect him and his money, and had handed out the money to the Islamic version of 'good causes'. Whilst doing this he had posed for a photo. All the young Asians who knew nothing about this candidate now know all about his 'charitable' activities. They now have respect (pun unintentional) for him as a result of Labour's publicity !! In Bradford we seem to have an interesting heirarchy. A candidate brandishes an AK47. A sitting Cllr has an RPG. What about the Committee Chairman and the Group Leader. The Labour Group Leader and Council Leader, Cllr Ian Greenwood is known for suppressing all dissent within his Group, in brutal New Labour fashion. Can we expect to see a photo of Cllr Greenwood driving a T72 Tank through the Labour Group Rooms at City Hall ? Ivan, I think that you could well be right in stating that the publicity surrounding the Respect candidate could actually win him support from amongst the constituency that you mention. Although Asif Khan stated that he frequents "shooting grounds" near Skipton, for some reason I cannot imagine him striding across a grouse moor. How do you know he is a Muslim? Do you have information to the contrary? If so, then I am afraid that certain members of his "community" would take a rather dim view of his apostasy, the punishment for which is . . . certainly losing a lot of votes if not his head. It`s strange how these people (Many muslims) seem to have an unhealthy interest in death and violence! Could it be after reading islams so called holy books they are possessed with a demon of death and war against unbelievers! Well, Mo did seem to have a bit of a taste for blood and guts, and sadly, many of his followers seem to share in this. Tommy Robinson to appear on Jeremy Kyle? Luton in ‘harmony’, or Luton in discord? Le Pen set for more than 20%? Internet Censorship: Protection for Whom? The Sound of Confusion: another “Freedom Party”? Bradford May 2012: a Respect Breakthrough?